Studio safety is the most important consideration when setting up a home jewelry making studio especially when you are working with chemicals or a torch. Make sure to protect yourself, your family and your home by getting all the facts you need regarding the materials and tools you will be working with. Protect your hands and skin from contact with irritants and chemicals by using gloves and barrier cream. Your skin is your body's largest eliminative organ and therefor also a viable way to absorb toxic material. Use proper protection such a latex or nitrile gloves. Protect your eyes from particles, sharp objects, splashing chemicals and anything that may suddenly come in the direction of your eyes by using goggles. Make sure to install a lock on the door if you have small children. Keep all caustic materials out of reach of small children and pets in a high cupboard that can be locked. Install an extractor fan to whisk away toxic fumes. Make sure to wear a well fitting dual cartridge respirator when working with fumes, liquid chemicals and solder. Use a particulates filter on your mask if you are working with powders, air borne particles and certain kinds of fumes. Keep a well maintained fire extinguisher next to you in your studio if you will be working with a flame or a torch or in case of any risk of fire. Obtain MSDS reports and get to know the products you are working with. Read all the precautions, accompanying literature and labels regarding your products. When a label says "use in a well ventilated area" get the information you really need as this usually indicates that the product is toxic and should not be used without a mask for extended periods, even in a well ventilated room. Never work with challenging materials or with a torch when you are over tired or under undue stress. Accidents tend to happen when one is either physically or mentally tired or when working in haste. Fire Extinguisher Tip 1: While you may want to keep a fire extinguisher out of reach of small hands always make sure that you sit the extinguisher within close reach, next to you, while you are working. You do not want to have to reach over a fire to put out a fire. Fire Extinguisher Tip 2: Always read all the information that accompanies your fire extinguisher and make sure you know how to operate it. Also make sure that your fire extinguisher is in proper working order and replace it when necessary. Exercising studio safety is the first most important factor in starting your jewelry making studio. While it may sound daunting it really is quite simple. Most of the products you will work with will probably not require serious protection, but consider that you may be working with them for years to come. In the long term, taking precaution will benefit you and those you love. Remember your value. After all there is no one out there who is... YOU! Life is too precious not to take good care. While a product label may only recommend that it be used in a well ventilated area this kind of minimal precaution is really only intended for one time or for occasional use. When it comes to studio safety in the business of jewelry making you will need to consider how many different materials you will come in contact with and understand that chemicals can be absorbed in different ways. Many products will have MSDS reports online and you can find them by doing a Google search. If you cannot find what you are looking for online, call the manufacturer and they will fax or email you the sheets. Over the past 25 years I have heard heart breaking stories about artists who became seriously ill due to over exposure to certain metals or chemicals. When practicing studio safety you must consider the different ways you can absorb chemicals or particles. You can absorb both through your skin and your respiratory system. Solder - While some jewelers still use solder containing lead I personally will not. Sure it is cheap and easy to use, but loss of health is much more costly in many ways! Soldering Flux - Make sure to protect your skin, eyes and lungs from solder and flux fumes and from contact with the flux itself. Cements - Jewelry cements that hold tend to be toxic and therefore you must protect your skin and your lungs. Resin and Epoxy - Again protect your skin and your lungs when working with these. Lacquer and Varnish - Protect your skin and your lungs. I have seen video demonstrations using the same cement that I use for jewelry making and I am really surprised to see there are no references made to protecting yourself from the cement fumes. While I appreciate that the demonstrator cannot be wearing a mask while showing how to use the product it is vital to convey what sort of precautions should be taken with use of such chemicals and in this case it is not sufficient to simply ventilate the room. When purchasing a mask you will want one that can be fitted properly, is light in weight and has the availability for the cartridges and filters needed for your specific work. I love the mask that I use. It is light weight, affordable, comfortable and effective! 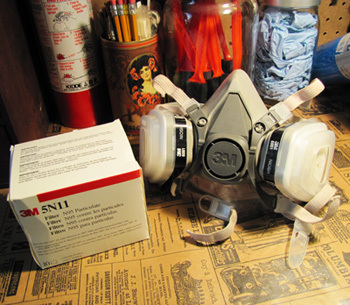 I use the 3M 6200 series mask with organic vapor cartridges and a particulates filter. Please check with 3M directly to find out which cartridges and filters you need for the products you are working with. Here is a photo of the mask that I use. Warning... while the filters I use are perfect for my particular applications you must consult with the manufacturer regarding your specific requirements. After you obtain all the MSDS information on the products you will be working with you can call 3M and get help on choosing the correct mask, cartridges and filters for your specified materials. I found them to be very friendly and extremely eager to help... the way it should be. I highly recommend going to a supplier in person so that you can have the mask fitted properly as they come in three or four sizes. I am five foot two and I wear the medium comfortably. I believe they are sized for real people so a small really is a small. I purchased my mask at Acklands Granger. Their website will give you a list of store locations that may be in your area. Mask Tip 1: While the straps on a mask seem like a logical way to hang a mask when not in use, it will quickly stress the elastic and cause an improper fit that can no longer be adjusted. Mask Tip 2: If you can smell any fumes through your mask you have either not fitted it tightly enough, it is too large or you need to replace the cartridges. This is an interesting point regarding studio safety. If the product does not have a smell is it safe? Not necessarily. There are some products on the market that have reduced fumes. It's really neat how they can do that...or maybe, not so really neat. That stinky fume is a warning sign that says "protect yourself." In other words, still get the information and practice studio safety. You could be working with a potentially taxing product for hours because it really doesn't smell so bad. I know it may seem a little fussy to wear gloves and a mask, but once you get into the habit it really is no big deal. You will find that the actual time you spend working with materials that require protection will be minimal and it is worth the investment in your health to do it right. Start a commitment to practice studio safety now. You are worth it and you have special people in your life who love you! Planning for a little person will prompt you to consider studio safety like never before. When I became pregnant with my first child I actually had no idea I was pregnant. My husband and I had been trying for a few months and our last attempt seemed a rather unsuccessful process and we really thought nothing of it. I didn't even entertain the thought that I may be pregnant and I was soldering and gluing without a mask. When I found out I was pregnant I bolted up in bed one night and thought "Oh my God... I was soldering and gluing without a mask!" I was truly terrified of what I had done. It took me months to trust that all was okay. Throughout the rest of my pregnancy I was able to get family to solder and cement for me and nine months later Oli was born...perfect and healthy. While we were very lucky, studio safety is a serious matter when it comes to a growing human being. There may be chemicals that you as an adult can tolerate, but they can be extremely dangerous to a growing fetus. Check with your doctor to get information on hot-lines or hospital programs that will counsel pregnant women regarding the use of specific chemicals and protecting your little being. In my city the hospital for sick children has a special department called Mother Risk. They offer a print out with lists of safe and unsafe household chemicals and medications. You can also book a consultation and bring your MSDS reports and specific concerns regarding studio safety and protecting your unborn child. Installing an extractor fan is one of the most important things you can do regarding studio safety and protecting your lungs and the air in your home. I use a simple bathroom fan. It is inexpensive, effective and relatively simple to have installed. You can purchase the fan and materials for about one-hundred dollars from a building supplier such as Lowes or Home Depot. When choosing a fan check the product specifications to make sure the fan will properly ventilate the square footage you have in your studio. If you do not have someone close to you who knows how to properly install it, call a professional who can vent it out of the wall and who is a qualified electrician. The cheapest route is to have the fan mounted to the ceiling and not in the ceiling, as ugly as that may be. 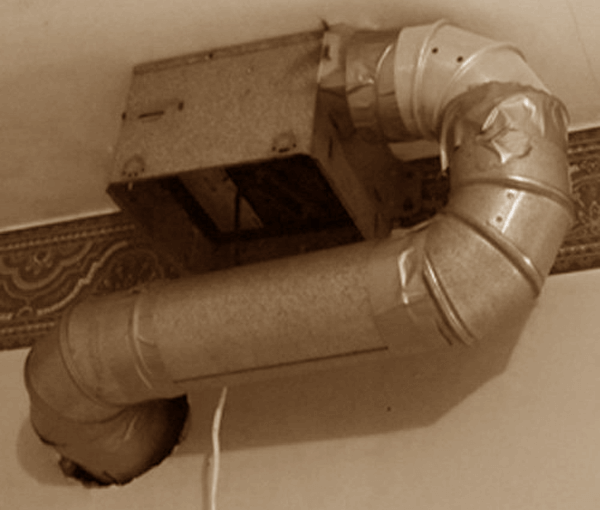 Once the fan is up, you can use metal ducting to vent it out through the wall. If you would like your fan to be installed neatly to the ceiling like the one in the bathroom, bare in mind that it could, and it should, cost about eight-hundred to a thousand dollars to install. If you get a lower quote than that, I urge you to really get all the information you will need about who and how it will be installed. My husband was in the renovation business and he has fixed bathroom fans in homes where they were improperly installed. The installer decided to cut corners either out of ignorance or to save money. When vented through the ceiling the fan must be vented out properly through the roof and not just into the attic. There must also be minimal turns on the ventilation pipe to extract properly. Here is a photo of my exhaust fan. Please ignore the hideous wallpaper border. It came with the house : ( The installation is a tad unattractive, but it sure does a fabulous job at clearing the air! Fan Tip: I use a foot controlled on/off extension that was sold as a Christmas tree light control. I love it and I can keep the control at the foot of my work table for easy access. Once you have a fan in place you will be amazed how quickly it cleans the air of fumes and you will wonder how you ever got along without one! It is truly number one in terms of studio safety. For more information on studio safety here is a great video from Nancy Hamilton at nancylthamilton.com. I absolutely adore her website and she has a ton of excellent videos on jewelry making. Nancy has a great casual way with her humor and she shares highly detailed expertise. Not only is she a fabulous artists, she is also a great teacher! Nancy's video on studio safety encompasses more information for those of you who are making fine jewelry.